Engineered Art's current flagship product is RoboThespian, the robotic actor. A full-sized humanoid with a biologically inspired design, RoboThespian is used by research and education centres the world over, to inform, to entertain, and to investigate new developments in robotics. Institutions in over 20 countries, including NASA Kennedy Space Centre (USA), Gazientep Planetarium (Turkey), Questacon Science Centre (Australia), and numerous universities world-wide are using RoboThespian every day. Maplesoft technology was used in the design and modeling of balancing and talking RoboThespian robots. 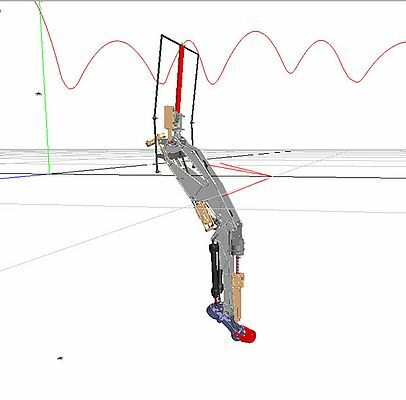 MapleSim, the system-level modeling and simulation platform from Maplesoft was used to design the biologically analogous humanoid robot leg integrating a novel actuator, studying its static and dynamic stability, and building the designed leg to determine strategies for its control. However, RoboThespian, for all his conversational appeal, is largely static. His legs are powered, but he can merely squat and stand in place, never moving from a fixed location. According to Guillaume Hirohide Sasagawa, an engineer at Engineered Arts, "In Byrun, we want to integrate more human-like dynamics into the mechanical design. Using a human-inspired approach at a hardware level makes walking, running and jumping possible without rigid, robotic-looking motion." MapleSim assisted in Byrun's design by allowing engineers to simulate complex, nonlinear, compliant components such as his pneumatic muscles and parallel springs. These are used for safety compliance, shock absorption, energy efficiency, and human like smooth motion curves. Engineered Arts specializes in unconventional actuation solutions, chosen to best suit the application. Motors are fast and precise, but inefficient and rigid. Pneumatic actuators, on the other hand, are powerful and energy efficient, but difficult to control. The conventional approach in robotics is to use a single actuator for a single joint - Byrun will use a parallel electro-pneumatic design, where multiple actuators control single joint actions. This approach utilizes the best facets of both types of actuation, while compensating for their drawbacks. Conversely, some actuators will generate coupled motion across several axes, to imitate (for example) the organic design of the human shoulder. This makes for more natural-looking motion, but can be potentially difficult to control. Here, once more, Maplesoft comes to the rescue, providing advanced solvers that can tackle the difficult multi-variant control equations used to develop Byrun's motion algorithms. By creating virtual prototypes of each design phase in MapleSim, Byrun's engineers can investigate the feasibility of mechanical solutions without needing to create a laborious series of prototypes. "The software helps us to create the design parameters in a very fast virtual environment," explained Guillaume. "We are no longer required to rebuild the robot for every design iteration, which saves us significant time and cost, and allows us to explore more radical options. As well, complex kinematics can be easily simplified with the use of Maple - this is a powerful tool as the resources required for the project are considerably reduced." Byrun's hardware requires modeling mechanical, electrical, thermal and pneumatic elements - with the help of the simulation tool MapleSim, the component requirements can be largely anticipated in advance. The team at Engineered Arts Ltd. has also found MapleSim useful for its ability to simplify complex calculations. "MapleSim's ability to automatically generate complex mathematical models, such as the leg dynamics, is outstanding. Different parameters can be altered at different stages to reduce the complexity of calculations," Guillaume said. "In the case of Byrun, we were able to dramatically simplify the leg dynamics, making the computations much faster. This is extremely powerful and has real impact on our project timelines and deliverables." In addition to designing Byrun's electro-pneumatic hybrid legs and upper body for fully mobile walking and running, the engineers at Engineered Arts Ltd are also developing a robotic hand with the same principles, creating a compact, highly efficient compliant manipulator. They have designed an elbow joint with unconventional kinematic characteristic in humanoid robotics with electro-pneumatic parallel actuation, and are currently making a full torso-shoulder-arm model in MapleSim. This model will be used for solving forward kinematics, inverse kinematics, end-effecter dynamics and compliance.